← Moving your child to a seatbelt… what’s the rush? Dear 16-year old me…let’s be safe in the sun! Dear sixteen year old me, who knew that melanoma is a young people’s disease and like the elephant, our skin never forgets. Dear sixteen year old me, I never told you that that our days of sunning by the backyard pool would lead to you getting melanoma and countless nights of worry. Dear sixteen year old me, I didn’t know back then that sun burns we got during our childhood years increased our chances of developing skin cancer later in life. Dear sixteen year old me, if I could have shared one piece of advice I would have told you to have Safe Fun in the Sun and protect yourself from the sun’s harmful rays. Knowledge is power and prevention is the key. Learn about the UV Index and take sun protection actions! Keep infants under 12 months out of direct sunlight. Babies and young children have thinner, more sensitive skin than adults. Teach children how to seek shade or create their own; sun rays are strongest between 11:00AM and 4:00PM. If your shadow is shorter than you – find some shade! Protect yourself from reflected sunlight; UV rays can bounce off sand, water or pavement and go through clouds. Wear light loose fitting clothing with UV protection; denser, darker fabrics; wide-brimmed hats. Wear UVA and UVB safe sunglasses. UV rays can damage our eyes. Apply and reapply broad spectrum sunscreens with SPF 30 or higher to exposed skin as directed; don’t forget your ears and nose. Use SPF 15 lip balm. Get to know your moles, signs of skin damage, and when to follow-up with your health care provider. 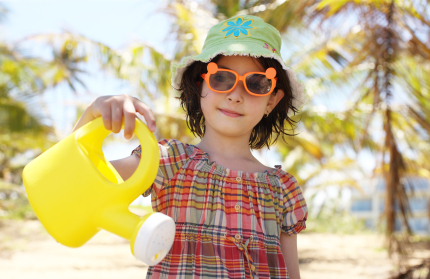 Role model sun safety habits. It will make a difference to the long-term health of your family. Dear sixteen year old me, the news is good. Because you acted early and sought treatment you went on to have two beautiful children that now have lives of their own. You became a public health nurse and have made sun safety an important part of your work. We are going to be okay. You don’t know this yet but you are looking forward to being a grandmother! Cora MacLeod, RN is a public health nurse who has worked in public health for many years. She works in Early Years Health Program with a focus on the preschool years. She has a passion for community outreach and injury prevention. Cora is an accredited Triple P and Nobody’s Perfect facilitator. A busy, active mother of two adult children, Cora looks forward with excitement to the future when she can share her experiences with her grandchildren. This entry was posted in Babies, Children & Tweens, Keeping Your Baby Safe, Keeping Your Child/Tween Safe, Keeping Your Teen Safe, Keeping Your Toddler & Preschooler Safe, Parenting, Parenting Your Baby, Parenting Your Child/Tween, Parenting Your Teen, Parenting Your Toddler & Preschooler, Teens, Toddlers & Preschoolers and tagged babies, children, dear 16 year old me, melanoma, Physical Health, safe fun in the sun, school health, skin, skin cancer, sun, sunblock, sunburn, sunscreen, tan, tanning, teens. Bookmark the permalink. 1 Response to Dear 16-year old me…let’s be safe in the sun!